I confess. As much as I have been a fanboy of all forms of geek-fringe entertainment that this world has to offer, I would always rather watch Transformers or The Tick over just about any Anime. While Vampire Hunter D, Prokect A-Ko and a few others may have made the cut for me, I've never been the biggest fan of most Japanese animation, especially their TV shows. While I've always been familiar with the Blood: The Last Vampire property of manga, Anime, and anything else related to it, I had never experienced any of it till watching the live action film that hits DVD on Oct. 20th. Now that I've finally seen it, I'm not sure that I'll be re-visiting Saya's world anytime soon. The American/French/Japanese/Chinese hybrid production with a Korean lead star is a cinematic soup of too many ingredients without enough broth. In the battle of style vs. substance, usually style comes out the winner and we loose, but I only wish I could say that about this film. When you feel like you've seen everything that could be done in the live-action world to imitate Anime, you expect some form of innovation or dedication to the medium that the property originates from. In that case, you know that the script will be 10 pages of actual story and 75 pages of blood, guts, and gory glory. Well, the delivery comes pretty close to that, but even that would be an overestimation of Blood. In short, a halfbreed human/vampire gets hunts vampires to revenge her fathers death and an american military brat gets mixed up into the fray. The plot is as predictable, linear and vanilla as it gets and you get the feeling that they didn't really care that much going into it. The film looks like they wanted to make it as cool, violent, and slick as possible. While some moments and action sequences do more than just get the job done, the vast majority are recycled material. A laundry list of slices and dices you've already seen before, from animation to live action, make up the bulk of this sword and wire-fu features. Wooden performances and line delivery that you almost swear is dubbed ruin any chance of emotional character attachment that could ever come to be. Actually, with the lackluster script there was no chance of that happening anyway. The strangest thing about Blood is how well-made the film looks, while at the same time spitting out some of the worst CG moments this side of Mega Shark vs. Giant Octopus. 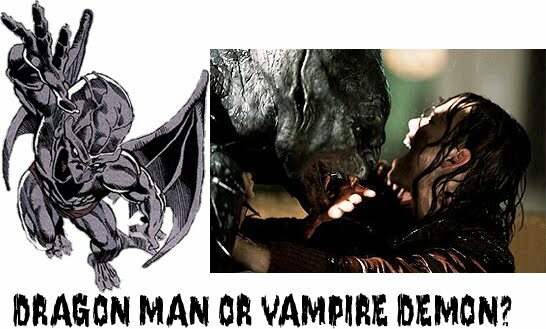 A fully vamped out demon looks like a slimy and grey rendering of Dragon Man from Marvel Comics, only about a 1/3 as cool. The rest of the film has a pretty slick production, so any time the poor CG is noticeable it looks even worse. If the the bulk of the movie had been a grainy and poorly produced mess, I wouldn't care so much, but the distraction of crappy computer animation in an otherwise well-shot film is unforgivable. Thankfully the writing was bad enough for it to not matter. It isn't like this film would be that much better if ILM was making CG blood splatters for this movie. The fact that this film takes place during the '60s is also a little distracting. While I have to accept the fact that this film's vision of the 1960s would be different than ours, just as easily as accepting that there are demonic vampires running around, there were still a few moments where the anachronisms were so strong that it took me out of the rest of the film. A high-tech sniper rifle is weird to look at when you have just seen a bunch of classic cars that are supposed to be "current." All in all, Blood: The Last Vampire is just too similar to everything that has already been done for me to take anything positive with me after watching it. The DVD includes a couple of making of features that total about 30 minutes. While they do show that the lead actress Gianna went through hell during the production of this movie, it did nothing to make me enjoy the film more or warrant the purchase of the DVD overall. Thankfully I didn't buy it. Whew! Still, there are much worse films out there, so if you're completely bored or a huge fan of Anime-style action and could handle the last two Matrix films, you probably won't mind this that much. Just be expecting a smaller scale of action with much more gore. If the film was bad enough to enjoy on an ironic level, I'd have been much happier with the viewing. Unfortunately, this film was too legit for a "Bad Movie Night". Still, It still wasn't legit enough to be any good.